Mentoring in IBD is an innovative and successful educational program for Canadian gastroenterologists that now includes an annual national meeting, regional satellites in both official languages, a website, an educational newsletter series, and regular electronic communications answering key clinical questions with new research. This issue is based on the presentation made by the issue editors at the annual national meeting, Mentoring in IBD XVII: The Master Class, held November 4, 2016 in Toronto, Ontario. 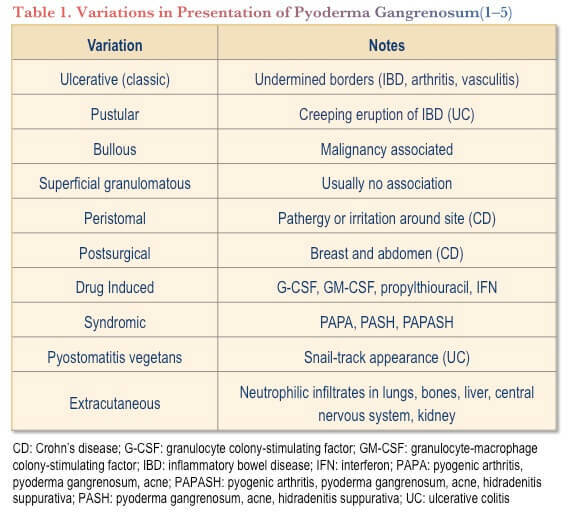 Many variants of PG can be seen in IBD, including classic ulcerative, pustular, peristomal, postsurgical, mucosal, and extracutaneous (Table 1). 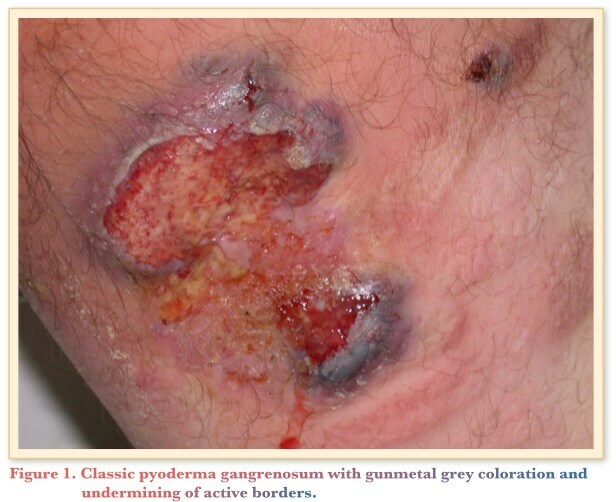 (1–5) Classic ulcerative PG lesions have a gun-metal grey border and are often undermined (Figure 1); they tend to heal with cribriform scarring and can be seen in both CD and UC. Pustular PG is more commonly associated with UC and presents with slowly creeping pustular lesions on an infiltrated erythematous base (Figure 2). The extremely rare mucosal PG variant, more commonly known as pyostomatitis vegetans, typically presents with a snail-track appearance to mucosal erosions and is almost exclusively restricted to UC. Peristomal PG is seen in association with IBD about 93% of the time, in contrast to postsurgical PG, which is seen most commonly after breast reduction surgery and uncommonly in IBD. 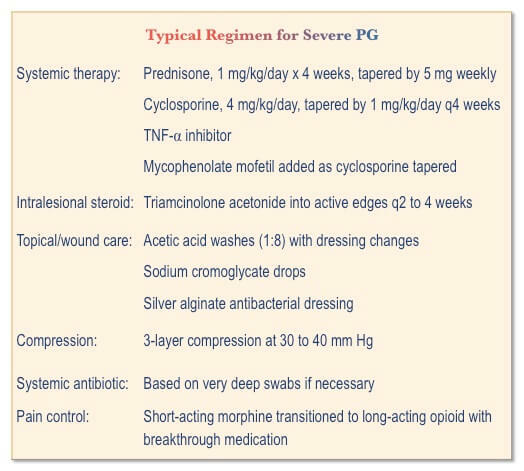 (6,7) Peristomal PG may take several months to develop, and it has a 61% recurrence rate, whereas postsurgical PG tends to develop about 11 days postoperatively and rarely recurs. PG is a diagnosis of exclusion, made clinically with histopathologic support in patients who satisfy identified diagnostic criteria (Table 2). (8) The differential diagnosis for PG includes infections (fungi such as disseminated blastomycosis, mycobacteria, tertiary syphilis), vasculitis (granulomatosis with polyangiitis, Behçet’s disease), immunodeficiencies (leukocyte adhesion deficiency, chronic granulomatous disease), toxins (loxoscelism from recluse spiders), malignancies (squamous cell carcinoma, lymphomas), and metastatic or dystrophic calcification (calciphylaxis). A biopsy for culture and histopathology is commonly taken from the active border of the lesion to exclude other diseases, and intralesional triamcinolone acetonide is often injected into the biopsy site at the time of the procedure due to the risk of pathergy. Topical, intralesional, and systemic therapies are used to suppress the inflammation of PG. Topical: Topical therapies are primary therapy for limited PG and adjunctive therapy for more severe disease. (9,10) Appropriate topical corticosteroids include potent agents, such as clobetasol propionate, halobetasol, betamethasone dipropionate, or fluocinonide. Calcineurin inhibitor ointments or creams, such as tacrolimus or pimecrolimus, may be useful. Dapsone is available in a topical acne formulation(11), and sodium cromoglycate in an otic or optic formulation can be used before applying an antibiotic to inhibit neutrophil activity. Pseudomonas colonization is common in PG lesions, and daily washes with dilute acetic acid (1:5 to 1:10 dilution as tolerated) may be useful in management. Alginate dressings can manage exudative PG lesions. Potentially useful antibacterial dressings include those containing activated silver, iodine, or crystal violet. The use of bacterial binding resins can assist in management of biofilms. Very deep swabs or biopsy for culture can determine appropriate systemic antibiotic therapy. Appropriate pain control is necessary to allow effective compression therapy. After short-acting morphine has been titrated to an effective dose, treatment can be converted to a long-acting opioid with the addition of a short-acting agent to manage breakthrough pain. PG is a chronic, often severe and disfiguring, inflammatory dermatologic manifestation of numerous chronic diseases, including IBD. Aggressive immunosuppression is frequently required to achieve and maintain control of PG, which may best be managed in conjunction with a dermatologist. Patel F, Fitzmaurice S, Duong C, et al. 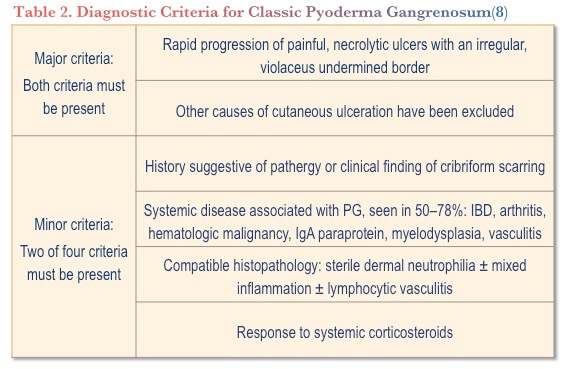 Effective strategies for the management of pyoderma gangrenosum: a comprehensive review. Acta Derm Venereol. 2015;95(5):525–31. Marzano A, Borghi A, Stadnicki A, et al. Cutaneous manifestations in patients with inflammatory bowel diseases: pathophysiology, clinical features and therapy. Inflamm Bowel Dis. 2014;20(1):213–27. Chiang IH, Liao YS, Dai NT, et al. 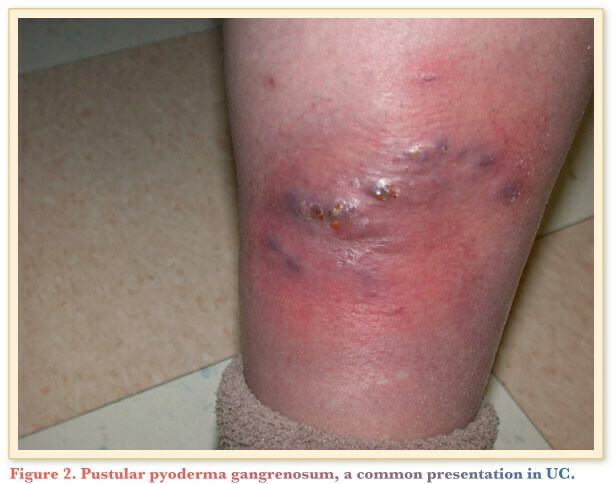 Hyperbaric oxygen therapy for the adjunctive treatment of pyoderma gangrenosum: a case report. Ostomy Wound Manage. 2016;62(5):32–6. Local or systemic dermatologic reactions are common. (4) Injection-site reactions have been reported in 30 to 40% of studies. Infusion reactions can be modulated by pretreating with anti-inflammatory agents and by altering infusion rates. 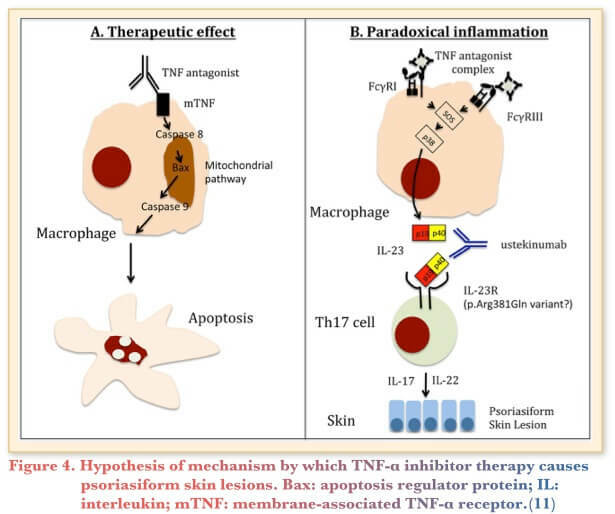 TNF-α, in addition to its important role in inflammation, has an impact on tumour biology. A cohort study assessed the risk of squamous cell carcinoma in 46,409 patients with rheumatoid arthritis (RA), who had not been exposed to TNF-α inhibitors, in comparison with 12,558 patients with RA treated with TNF-α inhibitors and 379,666 matched individuals from the general population. (6) The study also assessed the risk of basal cell carcinoma in 43,675 patients with RA, who had not been exposed to TNF-α inhibitors, in comparison with 8,827 patients with RA treated with TNF-α inhibitors and 364,584 matched individuals from the general population. 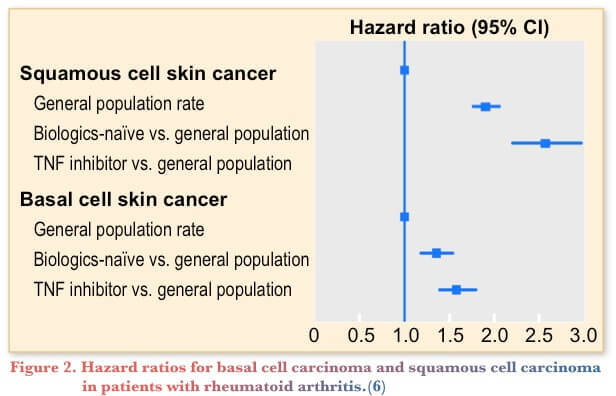 The study found that patients with RA have a moderately increased risk of basal cell carcinoma and almost double the risk of squamous cell carcinoma compared with the general population (Figure 2). (6) TNF-α inhibitors confer no additional risk of basal cell carcinoma but increase the risk of squamous cell carcinoma by about 30%. Another hypothesis involves the initiation of apoptosis in response to binding of the monoclonal antibody Fab fragment to the membrane-associated TNF-α receptor and activation of macrophages by the antibody binding to the Fc-γ receptor on macrophages (Figure 4). (11) This binding induces secretion of IL-23, which stimulates T lymphocytes to release IL-17 and -22, ILs that are required for development of psoriasiform skin lesions. A potential treatment may combine the use of ustekinumab, an anti-IL-12/23 antibody. Ustekinumab binding to the p40 subunit of IL-12 and IL-23 neutralizes both cytokines and reduces the psoriasis-induced lesions. 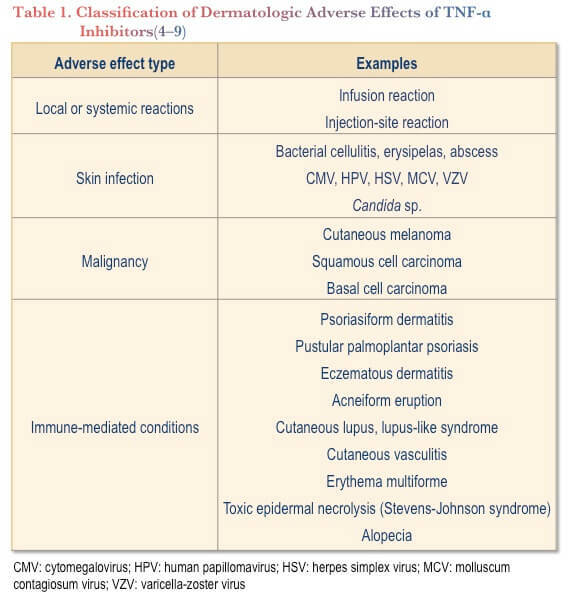 It is important for gastroenterologist to be familiar with the presentation of these dermatologic manifestations, options for their management, and the pathophysiology of these harmful adverse events. As TNF-α inhibitors may increase the risk of skin cancer, it is essential to advise patients to use sun protection. Given the risk of treatment discontinuation with severe dermatologic reactions, it is also vital to counsel patients about the signs and symptoms of cutaneous reactions and to advise patients to contact her or his gastroenterologist if they develop a skin reaction. It is advisable to have patients with IBD treated with a TNF-α inhibitor see a dermatologist regularly. Rapid access to a dermatologist can support optimal management of dermatologic adverse effects of TNF-α inhibitors. As the use of TNF-α inhibitors continues to increase, the diagnosis and management of cutaneous side-effects will become an increasingly important challenge. Denadai R, Teixeira FV, Steinwurz F, et al. Induction or exacerbation of psoriatic lesions during anti-TNF-alpha therapy for inflammatory bowel disease: a systematic literature review based on 222 cases. J Crohns Colitis. 2013;7(7):517–24. Maini R, St Clair EW, Breedveld F, et al. Infliximab (chimeric anti-tumour necrosis factor alpha monoclonal antibody) versus placebo in rheumatoid arthritis patients receiving concomitant methotrexate: a randomised phase III trial. ATTRACT Study Group. Lancet. 1999; 354(9194):1932–9. Rahier JF, Buche S, Peyrin-Biroulet L, et al. Severe skin lesions cause patients with inflammatory bowel disease to discontinue anti-tumor necrosis factor therapy. Clin Gastroenterol Hepatol. 2010;8(12):1048–55. Mocci G, Marzo M, Papa A, et al. Dermatological adverse reactions during anti-TNF treatments: focus on inflammatory bowel disease. J Crohns Colitis. 2013;7(10):769–79. Atzori L, Mantovani L, Pinna AL, et al. Cutaneous adverse reactions during anti-TNF alpha treatment for inflammatory bowel diseases: the experience of the Dermatology Clinic of Cagliari (Italy). J Pharmacovigilance. 2015;S2:004. doi: 10.4172/2329-6887.S2-004. Raaschou P, Simard JF, Hagelberg CA, et al, for the ARTIS Study Group. Rheumatoid arthritis, anti-tumour necrosis factor treatment, and risk of squamous cell and basal cell skin cancer: cohort study based on nationwide prospectively recorded data from Sweden. BMJ. 2016;352:i262. Flendrie M, Vissers WHPM, Creemers MCW, et al., Dermatological conditions during TNF-α-blocking therapy in patients with rheumatoid arthritis: a prospective study. Arthritis Res Ther. 2005;7(3):R666–R676. George LA, Gadani A, Cross Rk, et al. Psoriasiform skin lesions are caused by anti-TNF agents used for the treatment of inflammatory bowel disease. Dig Dis Sci. 2015;60(11):3424–30. 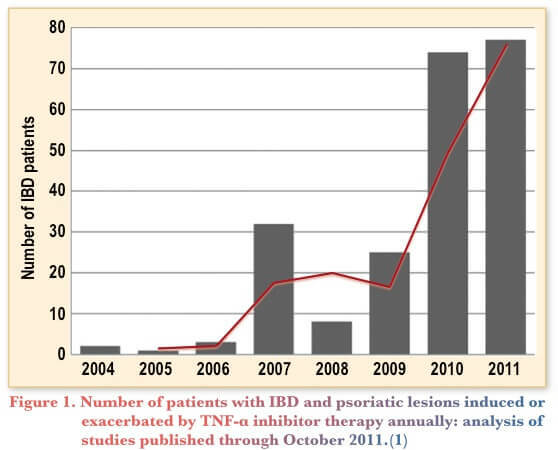 Niess JH, Danese S. Anti-TNF and skin inflammation in IBD: a new paradox in gastroenterology? 2014;63(4):533–5. Grine L, Dejager L, Libert C, et al. 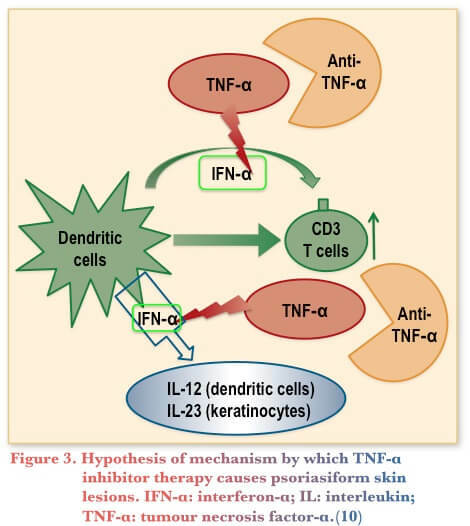 An inflammatory triangle in psoriasis: TNF, type I IFNs and IL-17. Cytokine Growth Factor Rev. 2015;26:25–33.